No more wait to get your hands on newly released iOS 7 Gold Master Firmwares (Build: 11A465) for iPhone, iPad and iPod Touch devices because at the main event of iPhone 5S and iPhone 5C launch in USA, Apple has officially releases and seeds iOS 7 Final GM Firmwares on iOS Dev Center website so if you're an iOS developer or non-iOS developer and don't have registered Apple UDID Account you can still officially Download and Install iOS 7 Gold Master Final IPSW Firmwares for iPhone 5, iPhone 4S, iPhone 4, iPod Touch 5G, iPad 4, iPad 3, iPad 2 and iPad Mini through Torrent/Direct Download Links. Apple iOS 7 GM Final (Build: 11A465) is now available via iOS Dev Center website for developers and non-developers so if you are registered iOS user than you can get iOS 7 GM update download files from Apple's official website but if you're not an iOS Dev Center user than you can download and install iOS 7 Final from below available official links. iOS 7 GM Final Update can only be installed freshly via iTunes manually and No over-the-air (OTA) update will be offered to iDevice users, so if you're currently running any old iOS 7 Beta Firmware Version on your iPhone, iPad and iPod Touch device than you will need to get the official iOS 7 GM IPSW files and manually install the firmware via iTunes method. So what you're waiting for? 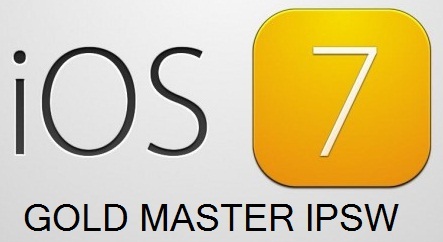 Torrent/Direct Download Links of iOS 7 Gold Master Final lPSW Firmware Version for iPhone 5, iPhone 4S, iPhone 4, iPod Touch 5G, iPad 4, iPad 3, iPad 2 and iPad Mini is officially available for iOS developers, non-developers and without Apple UDID registration. All below download links are officially uploads on Apple servers and all links are online, up and working.